The Bunny Plush Chair from tag is the perfect addition to any child's room or nursery! Made of soft polyester, this comfy chair is perfect to snuggle up to as well as the ideal companion for the little ones when they are reading a book or watching their favorite movie. Give the gift of snuggles when you get the Bunny Plush Chair for the little one in your life! For over 40 years, tag has been equal parts design, functionality, color, and value; creating gifts and decorative accessories for the home. tag has something for everyone and every room with collections that feature a wide array of products that are sold year-round, as well as seasonal products that help bring that special touch to any holiday decorating. 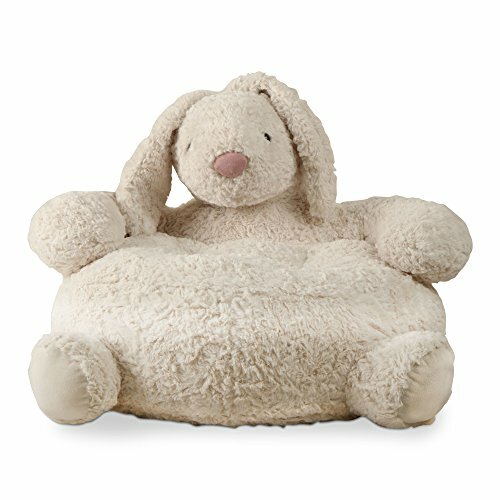 PERFECT TO SNUGGLE: The Bunny Plush Chair is made of soft polyester making it excellent to snuggle up to as well as the ideal movie companion for the little ones! LOUNGE IN COMFORT: The Bunny Plush Chair makes the perfect place for the little ones to cozy up and watch a movie or read a book! GIVE THE GIFT OF CUDDLES: These wonderfully soft chairs are the perfect gift for any child. Whether for a baby shower gift or birthday present this chair is sure to please! EASY TO CARE FOR: The soft polyester is super easy to clean! Simply spot clean the surface using water and some mild soap.